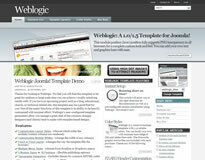 It's finally here, the latest theme from Joomlashack and it's packed full of functionality. It's called Weblogic and it all looks fairly logical to me, especially as it comes for Joomla 1.0.x and there is a native 1.5 version too! Okay, so where to begin. Firstly I've not played with it as it's only out today but it's jam packed with features including five modules styles in ten different positions, five colour styles, SEO optimised header, fixed or fluid width, customisable module widths and loads and loads more. Need I go on? Basically you can make this theme look completely unique without having to do all the boring developing right from the beginning. If you've got a project coming up soon, then this theme might very well be what you purchase. Click here to visit Joomlashack for more information.